Teachers have a variety of needs depending on the teaching environment. 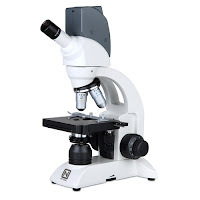 Below is a review of some of the best teaching microscope that provide different options to ultimately enable teachers to perform their job with a bit less hassle. For the teacher who wants each student (or group of students) to have their own workstation with a basic biological microscope that provides 40x, 100x, and 400x magnification, the HS-1M Student Microscope is an inexpensive solution. 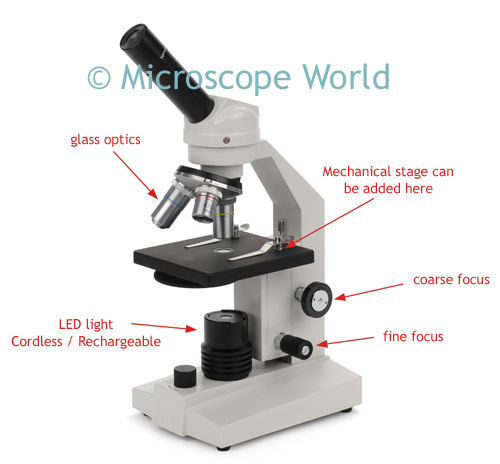 The microscope has the option to add a mechanical stage. This microscope is the most popular high school model as it meets U.S. high school standards and provides both coarse and fine focusing adjustments, as well as having a cool LED light source that will not harm living specimens. The microscope can be operated corded by plugging in the included recharger, or cordless. The WiFi wireless teaching microscopes create their own WiFi network (you do not need another wireless network) that allows connection of up to six Android or Apple devices such as tablets or iPhones. A free app is downloaded on each device and live images can be streamed from the WiFi microscope directly to each device. The WiFi microscopes are available both as biological compound microscopes or stereo dissection microscopes. Rather than purchase a large number of microscopes, the WiFi microscopes can be used with multiple students at one time since each student can view the microscopy image on their personal device. A tablet microscope provides a live image directly on the tablet attached to (or next to) the microscope. 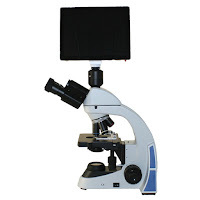 This LCD tablet microscope is a good teaching tool when it is easier to have a group of students gather around a single microscope rather than taking turns for each student to look through the eyepieces. Additionally, if a budget doesn't provide for multiple microscopes, a single digital tablet microscope can be a viable solution. The tablet microscope provides live images, the ability to capture and save images as well as capture to a micro SD card. The tablet microscopes also have WiFi capability that allows up to six users to connect to the microscope WiFi network and view live images on their own personal Android or Mac devices. An HDMI Video Microscope provides the ability to connect a teaching microscope directly with an HDMI cable to a monitor. 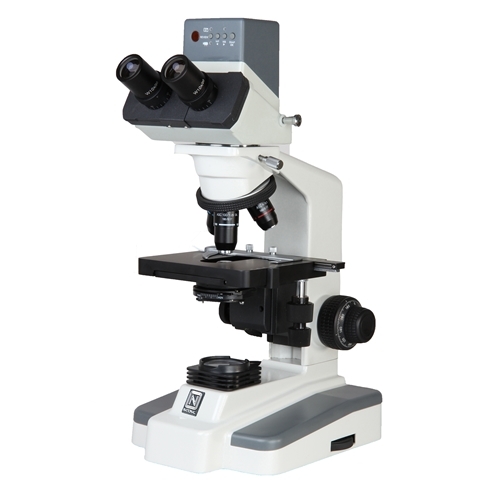 This teaching microscope can simplify the microscope connection process. Rather than needing to take the digital microscopy image through a computer via USB and then having to connect the computer up to an LCD projector, the HDMI cable option provides one simple connection between the digital microscope and the video screen. The video microscope also allows for image capture either with an SD card or by connecting the microscope through the USB port on the computer. Dual-head multi-viewer teaching microscopes can have multiple viewing heads ranging from two to five. These multi-viewer microscopes allow each student to look through the microscope simultaneously. 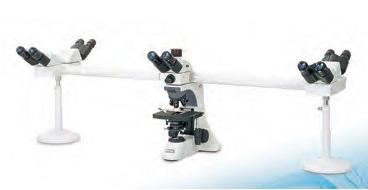 Multi-head teaching microscopes are typically used in Universities and for higher education.